Update: Windows 10 build 15031 for PC is now available. Windows Game Bar improved full-screen support: In this build, insider team added support for 52 additional games in full-screen mode with Windows game bar. As always, just hit WIN + G to invoke Game Bar to capture a recording or screenshot. Windows 10 build 15031 fixed the issue causing Tencent apps and games to crash or work incorrectly. While we fixed the primary bug causing this issue, some Windows Insiders may still hit nonstop exceptions in the Spectrum.exe service causing their PC to lose audio, disk I/O usage to become very high, and apps like Microsoft Edge to become unresponsive when doing certain actions such as opening Settings. As a workaround to get out of this state, STOP the Spectrum.exe service and delete C:\ProgramData\Microsoft\Spectrum\PersistedSpatialAnchors and reboot. Original Story: Microsoft is now testing Windows 10 insider build 15031 for PC and mobile build 10.0.15031.1000 internally. 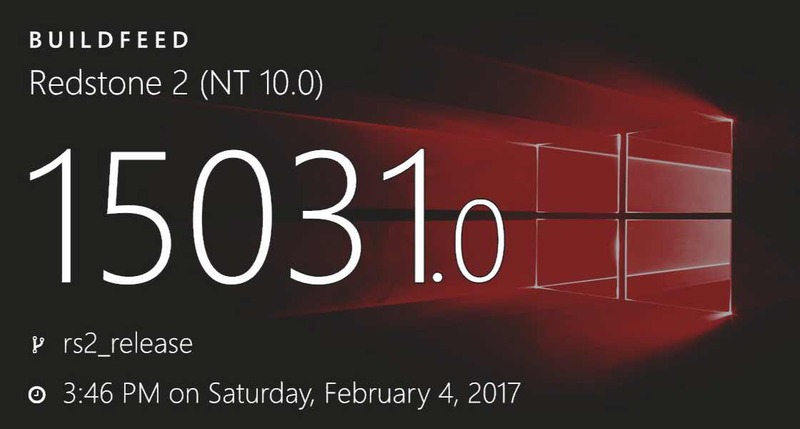 The new Windows 10 Creators Update Insider build 15031 is compiled on February 4. Insider team may release this build for Fast Ring members this week. Microsoft is also testing Windows 10 cumulative update build 14393.805 for PC and mobile build 10.0.14393.805. Recently, Windows insider team also released Update KB3216755 build 14393.726 for PC and Mobile build 10.0.14393.726 for Release Preview Ring members. Windows 10 build 15025 ISO images are now available for download. You can download ISO from here. Recently, Microsoft rolled out new Windows 10 Insider Preview PC build 15025 and Mobile build 10.0.15025.1001 for Fast Ring members. However, If you are facing issues with build 15025 like error 0xC1900401, build not yet available, download stuck at 0%, high CPU usage issue or other problems with the latest build, check out workaround here. Microsoft is expected to release Windows 10 Creators Update in April. The next major update Redstone 3 and Redstone 4 will come later this year and next year respectively.